Hard Dog Race (HDR) Base 2018 – can it get any tougher? Before you even leave the main road, a trio of sandy peaks can be seen ahead, in the distance. Small flecks can be seen slowly moving to the summit of each hill, then down again, then up the next, until the last one has been tackled. The ultimate goal of this event is a type of catharsis: the purification and purgation of emotions – including fear – through extreme activity, resulting in a sense of renewal and restoration. And this unique occasion is summarised by a simple slogan: ”Six feet, two hearts, one pride”. As you get closer to the scene of action, you can hear a joyful noise: dogs are expressing their enthusiasm with tail wagging, whines and happy barks. They are connected to their owners via long flexible leashes attached to customised jogging belts: something unusual is going on here. As the flecks on the sand dunes grow closer, you can begin to see that these are human competitors with their four-legged companions. They are soaking wet and tired, but they are smiling: they have nearly completed the challenge. A familiar team is running towards us, full of enthusiasm and with high levels of energy. One of the competitors is hugging me and she is almost shouting: That was amazing – just when you think there are no more challenges… you discover there are more ahead of you! It is clear that she and her team would run again, and again, or three more times again, right now, if they were asked to do so. Watching the team reach their goal, and feeling the energy flowing around them, you can tell that even before they had headed off that day, they had realised that it was going to be a remarkable experience. The race is organised in waves. At the starting line, the latest race entrants are milling around. They are warming up, ready to go, their excitement palpable as they wait for the starting signal. Some of the dogs are already soaking wet; their owners did not want to take any chances about their dogs overheating during the race, so they’ve drenched them with water in anticipation. The race briefing takes place, reminding everyone about the importance of the safety and well-being of the dogs. Competition is a big part of the race, but it’s not a matter of life and death: everyone has to pay attention to the health and welfare of their dogs. Now, at last, the race can start. Time to go! Let’s run, everyone! The initial burst of enthusiasm takes the teams quickly up the first hill, running hard. The warrior-like competitive nature of the race participants ensures that they keep running as long as they can. But that second hill is much more steeper, with a 45 degree gradient, far steeper than a normal cross-country run. This is a seriously challenging course, unique to HDR. Next, the first obstruction comes into view: a water-filled ditch. In the full heat of the day, the cool water is appreciated by humans and dogs alike: a chance to cool down for a few moments. The rest of the course is dotted with other challenges and obstructions: a weight vest, barrel, mud, a ladder, a cage, giant tires, agility tunnels and a high A-frame. A casual onlooker might see these as the biggest challenges, but the truth is that it’s the uphill stretches that hurt the most. They would be almost impossible without the assistance of a strong, helpful dog. The dog handlers, unconsciously perhaps, take great pride in the animals they’re racing with: despite the fact that the dogs may be hurting and may have difficulties meeting the challenges, they continue to work as enthusiastically as ever. Nobody gives up. Everyone who reaches the finish arrives with long strides, laughing and hugging their canine teammates as they cross the line. Could there ever be more moving, more touching scenes than these? …so what is it about HDR that’s so appealing? Contrary to what you might expect, it isn’t the performance on the day, nor the hope of a new medal that can be worn, nor the freebie T-shirt. It’s something far more than these. The race is all about the dog-owner relationship. 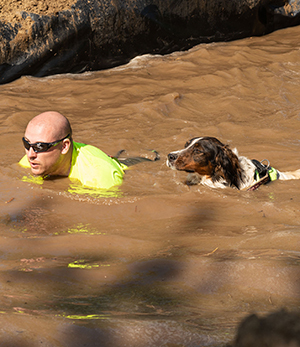 Competitors say that the race deepens their understanding of, and respect for, their dogs. They are amazed to see how hard they work, how they continue to respond to the “right” and “left” commands, how they don’t switch off and relax even for a moment, and how they immediately speed up to race pace after any temporary slow-downs. The animals must surely be exhausted, yet they continue to have a spring in their step, with an inner enthusiasm that goes on and on.